Ah, excuse me? What do flint knives have to do with the Gospel? A whole lot! Abraham believed God against all odds and as a reward he was given the special sign of the Covenant with God. And what was that wonderful sign between them? What kind of sign is that? But Abraham obeyed and at 99 years old, Abraham dropped his . . . well, anyway, he did the surgery and again demonstrated his faith and obedience to God. And so did all the men with him. Next we read of Joshua’s bloody job after the hundreds of thousands of men with their families crossed the Jordan River to possess the Promised Land. In the early Church, many of the Jews insisted that all gentiles be circumcised before they were allowed to be Christians. The Apostles, under the inspiration of the Holy Spirit in the first recorded Church Council (Acts 15) said “NO!” Thanks be to God! The whole gospel is about how Jesus came to save the Gentiles as well as the Jews. The question was, how do we get both groups into one family. Circumcision was one of the biggest issues in the way. Looked at in one way, the whole New Testament is about circumcision, how to deal with that and how to receive Gentiles into the family of God without it. 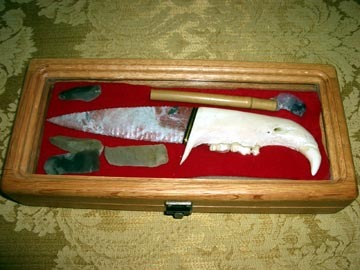 These flint knives were made for me as a generous and remarkable gift by Mike Cook of Portland Michigan. He is a “flintknapper” and primitive skills enthusiast (and also a student of the Bible!). The large one has a handle made from the jawbone of a black bear! They are beautifully crafted and will always be a gift I treasure and which I will use in my Bible studies and apologetic work. I am overwhelmed with his skill and kindness. I have also provided his letter about his craft and the biblical wisdom regarding flint knives and circumcision. You can read it here. Enjoy — and thanks so much Mike!